When I make a dessert, it must fulfill two requirments. It must be both a) tasty and b) beautiful. Some people think that the latter of these requirements is silly and that it all ends up in the same place, but I have always been a believer that half of taste is presentation and all of presentation is looks. This Apricot Coconut Cake fulfills both requirements. This cake tastes unbelievable. 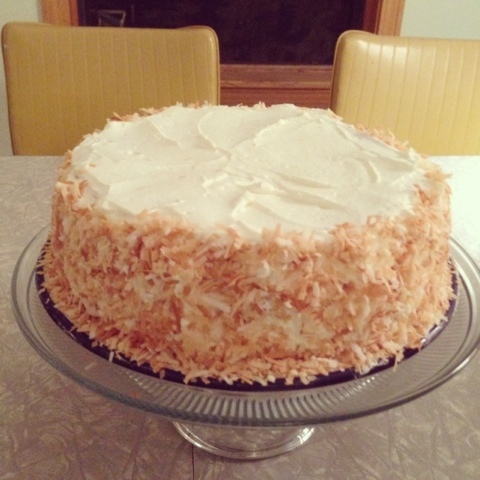 It's dense and almost pound cake consistency make it rich and decadent, and the whipped cream frosting and coconut give it a light and summery quality. Plus, it's beautiful, I mean check it out. You should make this cake next time you want to wow the kiddies. You won't regret it. Preheat the oven to 350 degrees. Arrange the coconut evenly on a baking sheet. Toast for 10-12 minutes. Butter to round cake pans (mine are 8-inch round cake pans, but 9-inch is fine too). Add parchment paper to the bottom of each pan and grease the paper as well. In a large bowl, mix flour, baking soda and salt. Using an electric mixed (I use a Kitchen Aid, but an electric hand mixer is fine too), beat butter and sugar on medium-high speed until fluffy. Beat in the eggs one at a time, then the vanilla and 3/4 cup of the apricot preserves. Alternatively, add the flour mixture and the milk until just incorporated. Divide the batter between the pans and bake 40-45 minutes until a knife inserted in the center comes out clean. Allow to cool 5-10 minutes in the pan, then remove from pan and allow to cool of racks completely. Using an electric mixer, beat the heavy cream, sour cream and 2 tbsp of powdered sugar until stiff peaks form. Add more powdered sugar to desired sweetness. 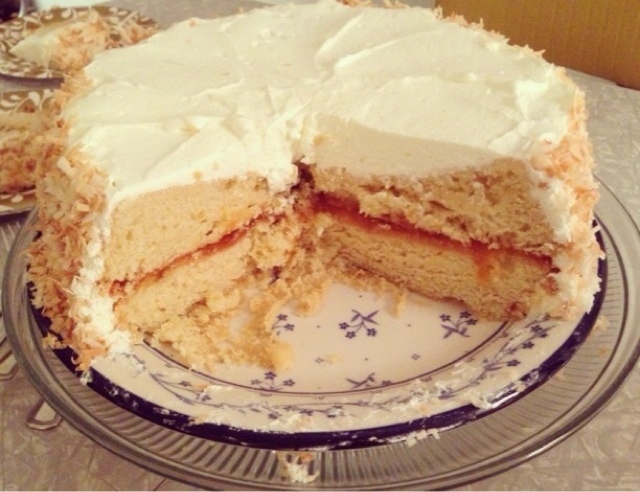 Spread the remaining 1/2 cup of apricot preserves on top of one of the cakes; sandwich with the other. 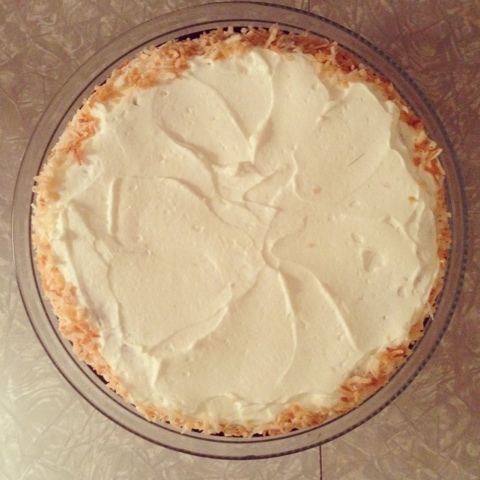 Frost with the whipped cream frosting and press the toasted coconut onto the sides. You come visit me and I will make it for you.